I notice most of the private clinics offer Influenza A(H1N1) Vaccine Jabs. It cost RM80.00 for the Jab. If you do not wish to queue at the Government Clinics then private clinics or hospital is a good choice to get the Influenza A(H1N1) Vaccine Jabs done. 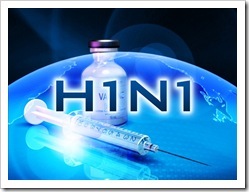 Did Big Pharma amplify H1N1 scare? A joint report into the handling of the H1N1 outbreak, to be aired on Al Jazeera, has found that key scientists who advised governments to stockpile drugs, had previously been on the payroll of big drug companies. The scientists were working for the World Health Organisation, whose decision to name the flu a "pandemic" is also coming under scrutiny from European investigators. More than 12,700 people worldwide have died from H1N1 – but the virus has turned out to less deadly than feared. Al Jazeera’s Jonah Hull reports on how big drug companies may have influenced the decisions that helped them profit from the H1N1 pandemic. This entry was posted on Wednesday, June 30th, 2010 at 2:23 am	and is filed under Travel. You can follow any responses to this entry through the RSS 2.0 feed. Both comments and pings are currently closed. MEXICO CITY: The government of Mexico lifted the alert for Influenza A (H1N1) Tuesday, officially ending the health emergency in the country where the illness first appeared 14 months ago. Secretary of Health Jose Angel Cordova said that as recently as October, 90% of influenza cases in Mexico were the A(H1N1) flu. But by May, it was down to 10%, the rest being cases of seasonal influenza virus that is less contagious. The A(H1N1) flu has declined in recent months around the world, after 17,800 deaths in more than 200 countries. In Mexico, 72,546 infections and 1,289 fatalities have been registered since the outbreak was detected in April 2009. Cordova said Mexico’s government will keep monitoring flu cases even with the lifting of the alert. The alert allowed officials to accelerate purchases of medicine to confront the virus. With the alert lifted, the process for obtaining medicine returns to normal. Some 27 million people in Mexico have been vaccinated against the virus. Mexico’s last death from the deadly flu occurred in May, just over a year after the government announced to the world the presence of a new influenza virus on April 23, 2009. Within days, the capital and many states across Mexico were practically paralysed after officials suspended schools and other activities and the rest of the world began to prepare for a potential global outbreak. In the following weeks, the epidemic was declared a pandemic by the World Health Organization. The Mexican economy was hit hard by the effects of the epidemic on tourism, retailing and other industries. Cordova said direct costs associated with the outbreak totalled 4.5bil pesos (about US$355mil or RM1100.5mil). KUALA LUMPUR: The healthcare industry is expected to contribute RM11bil to the country’s gross national income by 2020. However, said Health Minister Datuk Seri Liow Tiong Lai, the public and private sectors would have to work together to achieve the target. The healthcare industry is currently contributing only about RM4bil yearly to the country’s economy. As one of the 12 national key economic areas, the ministry has to ensure that the healthcare industry is contributing to the national economic development, Liow told reporters after launching the 8th Allied Health Professionals conference here yesterday. “We are transforming to not only improve services to patients but also to contribute to the country’s economic growth,” he said. He added that the ministry wanted to see that what is being done in the public sector is also shared by the private sector as well. “With this sharing, we are confident we will be able to improve our services,” he added. Liow said there was a need for an Allied Health Profession Act to ensure that only qualified, experienced and competent people are hired to serve patients and the public. “We want to formulate an Act that will ensure quality of services, monitor the treatment given and the safety of patients in the care of individuals in these professions,” Liow said. He added that the Act would protect the public from irresponsible individuals trying to profit by posing as health science practitioners. He said the Act also aimed to register and control the practices of the relevant professionals including microbiologists, chemists, forensic scientists, speech therapists, psychologists, x-ray technicians (diagnostic), dieticians, medical social workers and health education officers. Liow also said that the Allied Health Profession Bill, was in its final state of preparation and was expected to be tabled in Parliament next year. On another matter, Liow said that the ministry was also looking into the development of generic drugs. “In order to produce more generic drugs, we need to strengthen our labs and produce more pharmacists who are good in drug formulation,” he said. “I was told by the industry that our local graduates are good in drugs but they are no good in drugs formulation. “So, we hope we can train more pharmacists who can also focus on drugs formulation,” Liow said.